How to download data for offline access? 1. 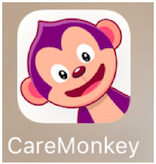 Open your iOS or Android CareMonkey application by clicking on the CareMonkey logo. Please ensure you are connected to a strong Wi-Fi signal or have a strong mobile reception. 2. Enter your login details. 3. After logging in, any changes/updates made on your account will be automatically downloaded to your phone. 4. The next time you log in, you'll see in the View offline data button the last synced date.